Dr. Y. Daniel Liang earned his Ph.D. in Computer Science from the University of Oklahoma in 1991, and an MS and BS in Computer Science from Fudan University in Shanghai, China, in 1986 and 1983. Prior to joining Armstrong, he was an associate professor in computer science at Purdue University in Fort Wayne, where he twice received the Excellence in Research award. Dr. Liang was trained in theoretical computer science. He was active in graph algorithms from 1990 to 1995 and published more than ten papers in several established journals such as SIAM Journal on Computing, Discrete Applied Mathematics, Acta Informatics, and Information Processing Letters. Since 1996, he has devoted to writing texts and published more than thirty books with Prentice Hall. His popular computer science texts are widely adopted in the world. 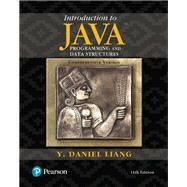 Dr. Liang was elected a Java Champion in 2005 by Sun Microsystems and has given lectures on Java internationally.